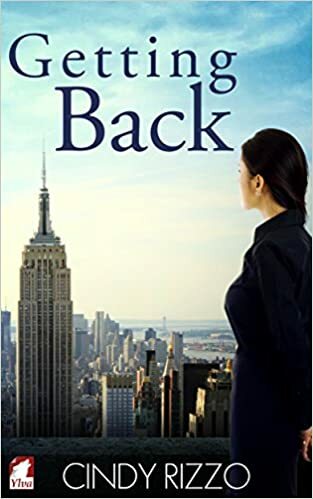 Cindy Rizzo’s newest novel “Getting Back” is an angst filled romance novel set in 2008, with flashbacks of a love affair in the late 1970’s. I personally like a story filled with the two main characters feeling some distress on the future of their love. “Getting Back” did not let me down. Elizabeth Morrison is a high powered CEO of her family’s business, Morrison Publishing. Queen Elizabeth, as she sometimes refers to herself is all work, all the time. Her life revolves around running the successful publishing house. Elizabeth is guarded and commanding, letting very few into her personal life. She lives her life longing for a love that was destroyed over 30 years ago. It is through her eyes and memories that this story is told. Ruth Abramson is the other protagonist in “Getting Back”. Ruth came to the United States with her parents in the height of the Cold War. The Abramson family risked everything to escape oppression for being Jewish in the Soviet Union. Her mother and father’s courage and strife in escaping their homeland maps the landscape of Ruth’s life. Rizzo, takes the reader into the present, 2008, and entrenches you in the life and pain of Elizabeth. While unbelievably successful career wise, she was stunted by losing her college sweetheart Ruth. She doesn’t wallow or pull the poor me card, quite the opposite. She works hard, doesn’t enter into series of causal hookups, she goes on with her life always knowing she had lost that special person that made living special. Her life peaked in college when she had Ruth. Ruth, unfortunately chose to bend to her parents dreams, and ended their relationship 3 year relationship to marry a man. The story is set going back and forth from the late 1970’s to 2000’s. It was fascinatingly told, and being pulled into the two time periods wasn’t confusing, it was poignant to letting you really understand the guarded Elizabeth, and the hurdles she could not overcome to attain happiness. Do not fear, this is not all angst. There is a love store here as well. After 30 years apart, Ruth makes contact with Elizabeth at their 30th college reunion. The connection between the two is immediate, but it is a slow process of gaining trust again. I loved the journey these two take as they come back together. There were times in the story that I felt like Rizzo got off on a tangent that was unnecessary. I felt as if I was reading one of those math word equations in elementary school that has that one extra sentence to throw you off. This was the case in “Getting Back”. These elements usually involving the sub-characters that were kind off strange. Fortunately it did not take away to much from her overall body of work. “Getting Back” was an interesting read.